On Saturday(November 10th) Tracee Ellis Ross joined her 'Black-ish' cast to celebrate the hit tv show's 100th episode and she showed off her hot on her instagram page. 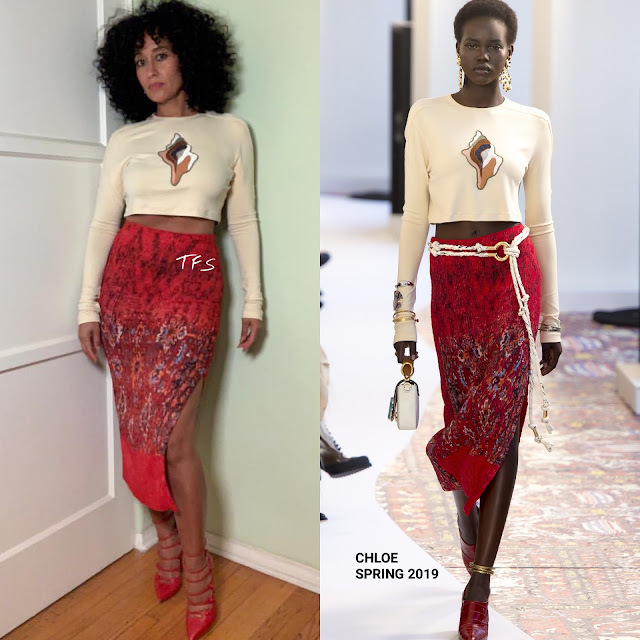 She posed for the gram in a CHLOE SPRING 2019 ensemble, which featured a ivory long sleeve crop top and a red printed midi skirt, with a side split. On the runway, her ensemble was shown with a ivory rope belt but the way Tracee fills out this skirt, it was not needed. Rocking her signature, natural curly Afro, she finished up her flirty, chic look with minimal makeup and red multi-strap heels by CASADEI. Are you feeling Tracee's instagram style?